I was invited to the launch of the new Halo stand in Debenhams in Manchester city centre on Friday, having never worn hair extensions in my life I thought it would be interesting to pop along. The first thing that caught our attention was the feather extensions, I had seen them on Fleur at some events recently & loved hers but to get them in the uk was proving difficult & expensive so when I saw they were available & relatively inexpensive I couldn't wait to try them & let you all know about them! Excuse my very scruffy hair! 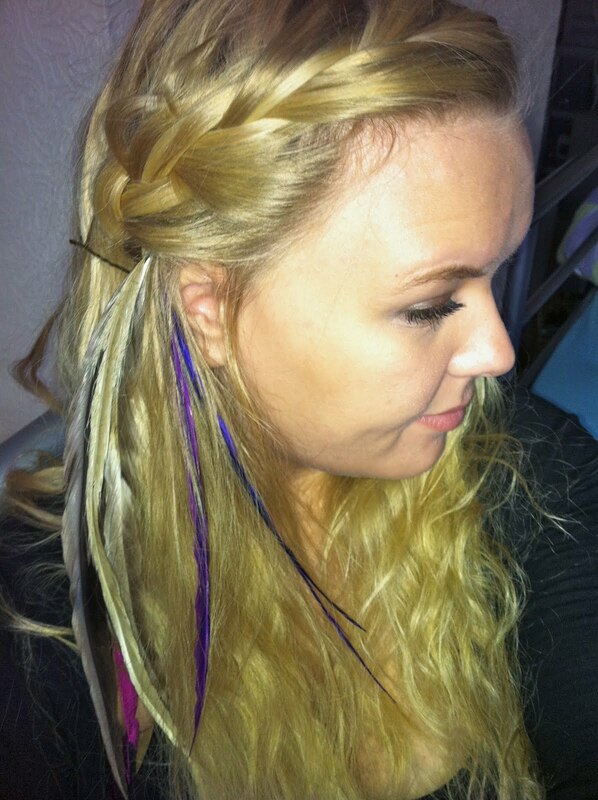 Initially I had the purple feathers put in but I thought if I had some more put in it would bring more attention to the purple ones so I purchased a set of natural ones & had them applied. I love them, at the moment they are so unusual & I have had a few comments & questions about them & they've only been in a day! They aren't at all heavy in fact I can barely feel anything in my hair, you can tie them up for bed & they didn't bother me slightly when I was asleep. You can have them applied in your hair at the Halo counter in Manchester or go on their website & purchase them for around £15 or £10 for the peacock feathers & apply them to yourself, all you need is a pair of pliers & it's as easy as that! They are reusable and last in the hair as long as you like as long as you're not too rough with them. In order to win a set just be a subscriber to my YouTube channel & comment on my video about the extensions, it closes on the 7th June. Good luck & I hope you'll look into these, they're perfect for the summer & festival season!